Gylfi Sigurdsson's stunning second-half strike gave Everton a 2-1 win against 10-man Leicester, after Wes Morgan was sent-off for the second time in three league games. Just 14 minutes earlier, Foxes captain Morgan received his second booking in 20 minutes for a foul on Richarlison. Richarlison had put Everton ahead on seven minutes with a close-range volley, set up by some wonderful trickery by fellow Brazilian Bernard, who was making his first Premier League start since his summer move from Shakhtar Donetsk. Just before half-time Ricardo Pereira scored a deserved equaliser for Leicester, which came from an Everton corner. The Portuguese full-back led a counter-attack, exchanging passes with Kelechi Iheanacho, then left Toffees defender Jonjoe Kenny on the floor as he twisted and turned inside the box before firing in at Jordan Pickford's near post - the final touch coming off the England keeper. Leicester continued to push for an equaliser after Sigurdsson's goal and deep into injury time, with Schmeichel joining the attack for a corner, Daniel Amartey missed a free header from close range. Everton have their first back-to-back wins this season and their first away win, to move up to 10th, while Leicester are in ninth. Everton started the match without a striker but their front four of Sigurdsson, Richarlison, Bernard and Theo Walcott gave them plenty of firepower. Richarlison was the furthest forward of the quartet and continued his goal scoring form since his £35m summer move with his fourth league goal of the season. He linked up well with Bernard, who showed that he can provide plenty of entertainment for Toffees fans this season. For the opener, he broke free down the left, dribbling past Amartey and Pereira, and then chipped across the box, which Schmeichel could only parry into the path of Richarlison. They almost had a second moment later as Sigurdsson almost got onto the end of Richarlison's scuffed shot. Walcott and Sigurdsson also had efforts saved from distance by Schmeichel in the first-half, which they just edged and they pressed for the winner after Morgan's sending-off. That came from a moment of magic from Sigurdsson who scored his 50th in the Premier League and his 19th from outside the box. It was the 29-year-old's fifth of the season in all competitions - his fourth in the league and the same amount as last term - as the club-record signing begins to repay the £45m Everton spent on him August 2017. 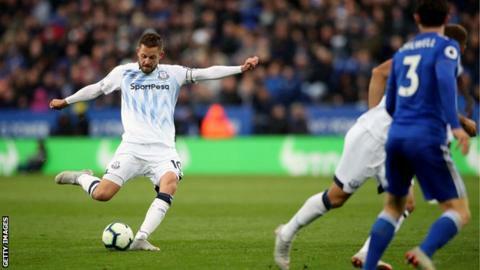 "It was fantastic for Gylfi," said Everton boss Marco Silva. "His quality in that moment showed how good he is and the way he took the ball and shot was fantastic. "He's playing a different role [to last season] and our style is completely different. It fits his profile better. "He has worked to get ready for this, working in training with great intensity. It's not just what he gives us with the ball but also what he is giving us without the ball." Silva added: "We deserve to take the three points. This is our image. It will be so in the future more and more, I don't have doubts about that," he said. "But we have many things to do to keep improving." Leicester boss Claude Puel felt Morgan's 63rd-minute sending-off changed the game. He admitted his side had started slowly, but they did grow into the first-half with Jamie Vardy flicking a header narrowly wide. The former England striker also went on a trademark run, latching onto a long ball and outsprinting Michael Keane, but he prodded a shot past the post with just Pickford to beat. Morgan, who was sent-off against Bournemouth on 15 September, picked up his first booking for a foul on Richarlison on 43 minutes, just after Pereira's goal. Ben Chilwell fired just over the bar after the break, but Morgan then went through the back of Richarlison and was given his marching orders. Iheanacho was the man sacrificed as Marc Albrighton came on to sure up the Leicester defence and Schmeichel kept them in it with a double save - a long-range effort from Lucas Digne and then a sidefooted shot from Tom Davies. But there was nothing the Dane could do for the winner. James Maddison, who was called up by England for the first time on Thursday, barely threatened in the game. "The sending-off changes the scenario of the game," said Puel. "We had come back into the game with Ricardo's goal and started the second-half well, with good intensity. "After the sending-off we did not manage the game well. I am not sure it deserved a second yellow but we have to manage it better." Sigurdsson scored his 50th Premier League goal, the second Icelandic player to reach the milestone in the competition after former Bolton and Chelsea striker Eidur Gudjohnsen, who scored 55. Sigurdsson has scored 19 Premier League goals from outside the box - no player has more since his debut in the competition, level with Philippe Coutinho. Richarlison has scored four goals in his six Premier League appearances for Everton this season - just one fewer than he scored in 38 games for Watford last term. Morgan has been sent off in two of his last three Premier League games. He'd only seen red in one of his previous 137 in the competition. After the international break, Everton host Crystal Palace on 21 October and Leicester travel to Arsenal on 22 October. Attempt missed. James Maddison (Leicester City) right footed shot from outside the box misses to the right. Assisted by Jamie Vardy. Attempt blocked. Lucas Digne (Everton) left footed shot from outside the box is blocked. Assisted by Cenk Tosun.